Soil testing is important for several reasons. You can save time, money and help the environment when you use soil tests to determine the proper amounts of soil amendments for your needs. Time and money are wasted when the homeowner over-applies soil amendments such as fertilizer and herbicides. The environment is harmed when fertilizers are over applied because the excess can run off into streams and lakes. Over-applied fertilizer is a major source of pollution that damages lakes and rivers by encouraging excessive algae growth among other things. Basic soil tests look for the amount of Nitrogen, Phosphorus and Potassium (NPK) as well as soil pH (acidity/alkalinity). Sampling needn't be complicated- the basic method is the same for gardens and lawns. The gardener will take samples from several areas then dry and mix them together in a clean plastic container. You will read that the proper tool to use is a soil probe, but most of us don't have one of these sitting in the shed. Using a trowel or spade is just as effective. Simply dig the trowel down into the soil so that you can dig out a 2-3" core of soil about 6" deep and place the soil into a clean plastic collection container. If the sample you take has vegetation, such as turf, place only the soil into the container. Once you have your sample, testing can be done by a lab or the gardener can purchase a testing kit. There are various types of soil testing kits available. Just like laboratory tests, the testing kits range from simple to complex. When using a kit, follow the directions for the proper amount of soil to use for testing. The benefit of doing your own testing is that you see the results right away. A downside to doing it yourself is that the sample sizes used with some of the kits are very small. This can cause misleading results, even if you mix your sample well. Generally, the less expensive the kit, the less accurate the findings will be. If you are sending the soil to a lab, they will give you instructions on how to package the sample for shipment. Some of them will furnish a shipping container. 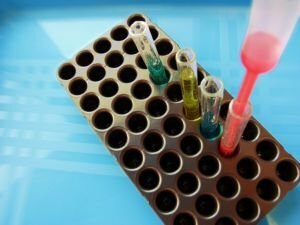 It's always best to check first with the lab of your choice to see what the costs will be as well as what the proper size of the test sample should be. The cost of testing increases based on the type of tests. For example, a simple test for soil pH and NPK can be done quickly and inexpensively. Tests for trace minerals, organic material, and soil types are more involved so the cost increases. While soil can be tested any time of the year, results from labs may come more quickly when sent in the fall, than in the spring. A third option is using one of the various electronic devices available. These devices offer only general guidelines and in our opinion cannot take the place of a good soil test. Once you have established the needs of your soil, you can take the proper steps to add the necessary amendments to your soil. Be sure to follow the manufacturer's recommendations on the package labels. The best time to apply soil amendments is in the spring and fall. This allows the amendments to get into the soil in advance of the needs of the plants. The Ohio State University Extension has a good fact sheet on soil testing with a list of soil testing labs. Two that appear to be user-friendly for the home gardener are Penn State and A&L Great Lakes Laboratories.